Getting out of the mass traffic jam known as the Dallas-Fort Worth Metroplex area yesterday took far too long for my liking. But finally I made it to Highway 287, a road I traveled many times when I lived and worked in Northern Utah and made yearly trips to Texas to visit family. 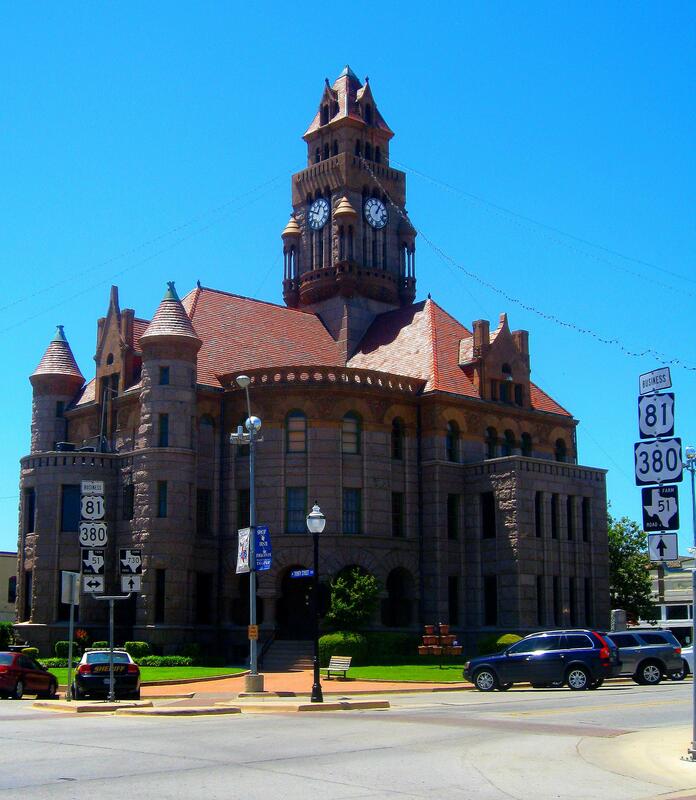 Once it went through all the little podunk towns, like Rhome, Alvord, Sunset, Fruitland, Henrietta and Decatur, as it made its way from Fort Worth to Amarillo. Now, so as not to slow travelers down, the grown-up, four-lane 287 bypasses them. I often rebel against this thirst for speed and quite often take the highway’s business routes so as to taste the flavor of each town’s unique personality. Decatur was one of the places I wanted to get to know better yesterday. One of the first things I saw in Decatur, after passing the abandoned Petrified Wood Gas Station that is now a designated historical site, was a mural on the side of a dinky convenience store. It stopped me and my camera in its tracks. 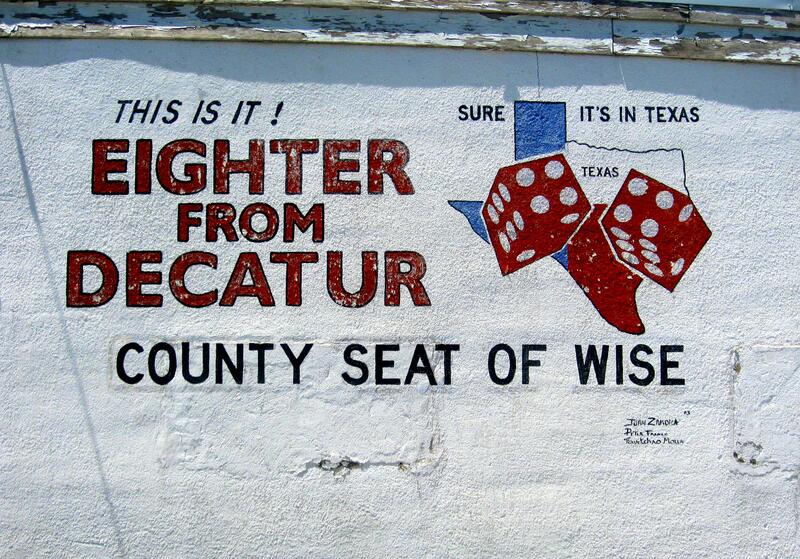 While I’m not a craps player, I had heard the term eighter from Decatur and knew that it was slang for rolling an eight with dice. But what was its origin? Did the saying actually begin here in Decatur? Wandering/wondering minds like mine always want to know. One of the stories I came up with when I did some online evening research was that it began with Will Cooper, a Decatur boy who loved playing dice and also a servant girl named Ada. Will was hired as a cook for Army regulars and some Home Guard members who were headed east to participate in a 1900 re-enactment of the Civil War battle of Manassas, also known as battle of Bull Run. It was a long train ride to Virginia and the troops entertained themselves playing dice. Will’s lucky slang wish, “Ada from Decatur,” when he wanted a roll of eight spread among the Texas troops on the east-bound train. Somewhere along the line it became eighter instead of Ada, or so this particular story goes. There’s always more than one when unrecorded memories are on the line. Do you have another story to add? Bean’s Pat: A Frank Angle http://tinyurl.com/7ntltz7 On a cute couple. My kids grew up with Rocky and Bullwinkle, which meant I got to watch them too. Anybody else out there remember these two loveable crazies? Awesome courthouse! Although many small town are mere shells of their past, some still have the charm of yesteryear. Meanwhile, I welcome your readers and encourage them to comment. Thanks for the Bean’s Pat! You’re welcome. My Bean’s Pat has been a fun, personal way to bring attention to all the great blogs out there.